In 1875, Arthur Lasenby Liberty opened his first drapery store on Regent Street. he called it Liberty. Selling high quality oriental silks, ornaments and objets d’art from the East, it attracted a discerning clientele with a taste for the foreign and the exotic. The artists Ruskin, Rosetti and Whistler were among Liberty’s first customers. Soon the store began to manufacture and print its own fabrics, with designs by artists like William Morris. With their fine quality silks and satins and their subtle and artistic colours, Liberty prints gained great popularity as dress fabrics, especially during the years from 1890 to 1920. 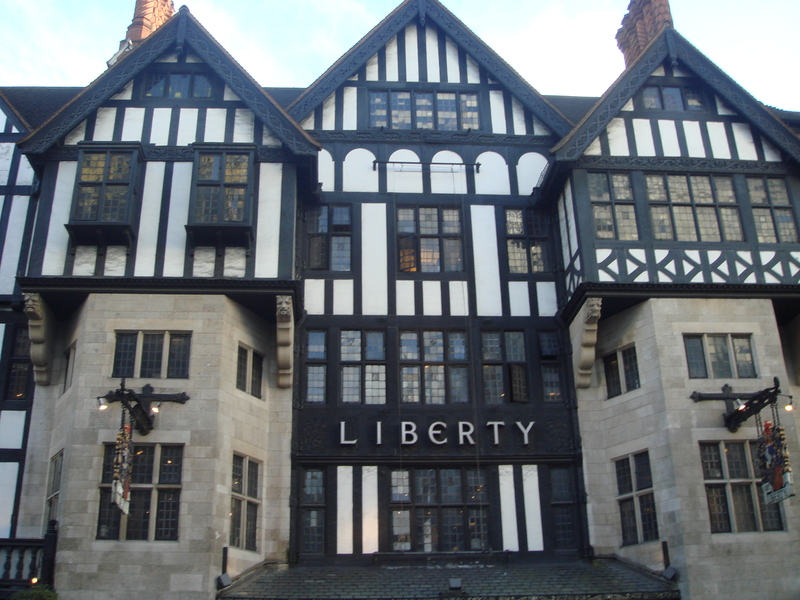 During the late 19th and early 20th centuries, Liberty’s had a considerable influence on contemporary trends in style and design, such as the Arts and Crafts movement and Art Nouveau, which was so closely associated with the store that it became known in Italy as “Stile Liberty”. 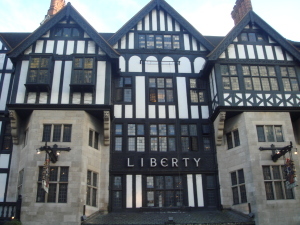 In 1925, after Liberty’s had outgrown its original premises on Regent Street, it moved to the present Tudor revival Arts and Crafts building on Great Marlborough Street. The timbers used in its construction were recycled from two British naval ships, the HMS Impregnable and the HMS Hindustan. The store’s quaint “country-house” exterior continues into the interior which is small, intimate and “old-world” with dark wooden counters and display cases, polished floors, stairs and decorative elevators. It curves around several wooden balconied, “mock-Tudor” style atrium with glass roofs. Today Liberty remains dedicated to fine quality and service. It continues to uphold its original style and traditions. It maintains its historic links with arts and crafts, selling original stationery, pottery, jewellery and furniture of the highest quality. On its top floor, it houses the period Art Nouveau, Art Deco and Arts and Crafts furniture which it so greatly influenced. It still sells the hand-blocked silks and other oriental goods for which it was known when it first opened in 1875. And the beautiful liberty prints are an enduring hallmark of the house. Yet, for all its old world charm, dedication to its arts and crafts foundations and its stile Liberty, Liberty has embraced and fully exploited the possibilities of the digital age. Liberty is out there online, offering its exquisite wares to loyal patrons and through its blogs, inspiring artists and craftspeople around the globe. In-house or online Liberty is a shopping experience like no other. Now with Liberty, the TV series, Arthur Lasenby Liberty’s store takes on another new life….